Like Totally Target on FB! Yay for another gift card! 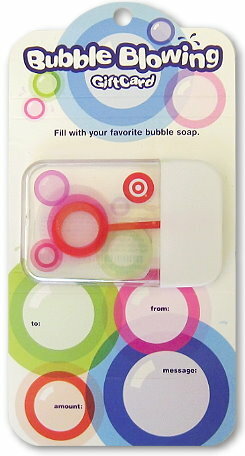 The gift card looks fun to use for bubbles. Thank you for all your hard work! Would love to win this giftcard! Hi! 🙂 Thanks for the chance to win! oops! I posted 2x.. sorry.This is meant to be my 2nd entry.. thanks so much for offering gift cards! So many things I could buy! I already like you on facebook. I wish I could “love” you on facebook, but there’s no button for that. already liked you on facebook! In it to win it! Thanks!!! Love Target! Thanks for the giveaway. BTW – I LOVE this card! It’s fun! And my grandson loves bubbles too! I would love to win, thank you! I liked you on FB & love your site.